Norway’s Duplicate Records interest in avant-garde metal releases is of course no news to any fan of the genre, reinforcing this extreme music with every album it puts out. But with their newest outcome, this very split album of two of the most promising up and coming black metal acts, our exprectations were set up high. Of course, I am talking about the collaboration of SMOHALLA with OMEGA CENTAURI in Tellur/ Epitome. 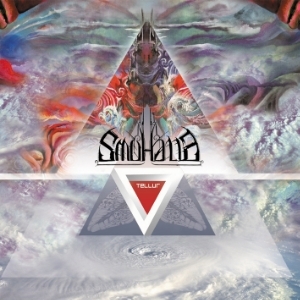 Hailing from France, SMOHALLA delivered once again some of the most unconventional, unpredictable and multifaceted metal, an equal continuation of their debut album Résilience. Featuring an amalgamation of black metal and electronic music, rich in symphonic elements and numerous other influences blended with originality and passion. With Tellur the band reached yet another territory of its ever expanding musical macrocosm, raising the speed and welcoming all the dangers such experiment would hide. What follows is a track-by-track review on one of what must be one the most intriguing releases of the year. Sa Voix Transperce Nos Fronts: The song begins with a slow drum beat embelished with a following bass rhythm as the synths create a terrifying ghost chant. It is just then that the drums signal the outburst of the guitars, beginning their perplexing, agitating high-tempo rhythm that took me by surprise on my first actual listen. ‘Sa Voix Transperce Nos Fronts’ may be one of the fastest Smohalla songs ever created but without losing a single drop of the atmospheric element the band is precicely known for, the fast paced nature of the song produces transient yet frantic and technical guitar riffs that along with the blastbeats makes the tension grow even higher, like an anxiety attack. The vocals are hysterical and impassioned, full of anguish as if time will soon elapse, generally a feeling of hastiness blooms thoughout the song. Indeed, the very last note of that harmonised tapping part during the middle creates the impression that there is no more sand to fall off the hourglass. As we process further into the album I can’t help but notice how exceptionally the background voices, keyboards and synthesized effects have been worked on and laid down on each of the four compositions, like a resonant ghost chant that mourns and haunts. SMOHALLA is probably one of the very few bands that manages to recreate such medieval and unearthly atmosphere presented with their own, unique way. La Main d’Abel: Listening to ‘La Main d’Abel’ is like trying to focus on something that is constantly circling around, fixed upon its captivating grandeur. This song is highly representative of Tellur as it encloses every emotion this album evokes and creates, it is a musical ecstasy that transcends and transforms. The guitar parts although they most certainly define and lead the song into supernatural paths, have lent the leading role to the keyboards this time, which have undertaken a fair share of the melodies. Slo’s vocals are rising like serpents, trying to tame an unrestrained tide that leads into intense paroxysms. Also, Camille’s bass lines are always present adjusting precisely, resulting in an avant garde style of music that combines a striking collection of elements, ranging from symphonic to electronic music, along with an assault of black metal influences. Although those influences are too many to number, SMOHALLA has managed to create a distinctive, signature sound of its own, and it shows. Les Passagers du Vent: SMOHALLA left the most epic part of their share for last. Still keeping the same fast, abrasive pace as the first two songs yet this is but another step forward. The song starts in a slow, torturing way but later takes its most epic form. The guitar work is surely the most progressive Slo may have experimented with, a maximalistic result of dissonance, chaos and melody combined. The guitars intertwine with the keyboards creating a strong outcome, every melody completes and continues the other like pieces of a puzzle. The music feels like absorbing and emiting its own magic, straying away from every Telluric substance. Aproaching the other ‘side’ of the split now, we find OMEGA CENTAURI. An overly avant-garde black metal band of their own proportions, a hybrid of black metal with post rock and ambient. Fresh from last year’s Universum Infinitum, this half English, half Swedish band has returned with the three lengthy but fascinating pieces, ready to leave their imprint on the growing avant-garde metal map. Here’s is the second part of the track-by-track review of the split. Naissance: As we enter OMEGA CENTAURI’S realm we instantly meet with their characteristic, raw and uninviting sound as Tom Vallely’s dark riffs unfold a more penetrating, discordant side, leading the listener’s mind into into higher, celestial territories. A really fitting collaboration for this second ‘side’ of the split, albeit quite different in terms of song structure, production and atmosphere – offering more of a traditional black metal collection of songs. The pace has noticeably slowed down, giving way to a more old-school approach in terms of guitar riffs and orchestration in general, with an artful extension of song structure. A structure based on the conception of epic, ominous passages that are (de)constructed in this song, a coarse architecture, balanced with the chaos of Rob Polon’s vocal sprawl and shrilling timbre. The guitar parts support the keyboards and vice versa. The addition of the lead guitar melodies create a specific mourning essence while the keyboards seem to spread like a haze over them. Submission: This very song seems to start exactly where Universum Infinitum left off (although these three songs were actually recorded between 2006-2009), with a distorted guitar strum marking its way into an ongoing spectral journey, a somber exploration that could may as well be the sound of mankind’s last gasp of air before its extinction. Or so it seems. An eerie, cold ambience reeks from this song as the angry vocal shrieks come and go. The guitar riffs are dark and resonant and with the melodies mostly absent through ‘Submission’ ‘s length, creating a certain sense of unease and distress with its disconsolate passages. With this opus OMEGA CENTAURI is blending black metal, post and ambient music into one monumental and diverging whole. Descuetude: The epilogue to this highly demanding album, this is not just a resigned walk in the falling rain. Although being mostly a simple ambient piece with just one clean guitar supplementing the ever falling rain that is sampled, this very pure and sincere composition that will surely take you to some strange places, conjuring dark pictures as you close your eyes. After some ten minute of silence the rain unexpectedly starts to fall again, an unforeseen surprise that put an end to this amazing journey in the nicest of ways with this post rock, ambient farewell that is quite reminiscent of ‘Quasar’ off of SMOHALLA’s debut album Résilience. Making this really long story short, I have to add that both SMOHALLA and OMEGA CENTAURI present a different aspect of modern black metal, trying to take the genre a step forward by simply playing with their heart and putting their feelings into their instruments. A really fitting combination tied in perfectly together like pieces of a puzzle. Tellur/ Epitome is a real experience that will surely make the listener embark into an astral journey. A real naissance…Try it. On	April 19 2013, this entry was posted. ← Get your very own Microcosm for free!